Good Thursday Morning! The week is almost over and I'm looking forward to a very nice weekend with DH!! My card for today is another oldie that I made. If I'm not mistaken, this one was for the Featured Stamper challenge on SCS. Loved the layout and I was in a pink sort of mood so I went with what popped in my head. I had to muttle up the background on this one as well---told you it was addicting! I ended up sending this card to a friend of mine that lost her mom....it did cheer her up so I'm thankful for that. My daughter's party is this afternoon and I'm going to spend the rest of my morning working on my Etsy card. Hope you all tune in to check it out along with the other design team's work. Thanks so much for stopping by and have a great rest of the day!! WOW Jackie, this is really pretty. I love that pink! Question: How do you like Etsy? I'm thinking of it. Any suggestions? Thanks. I love that flower image! I'm a huge pink and black combo fan! Super cute! ohhhh anything pink always works for me! Fan"freakin"tastic! 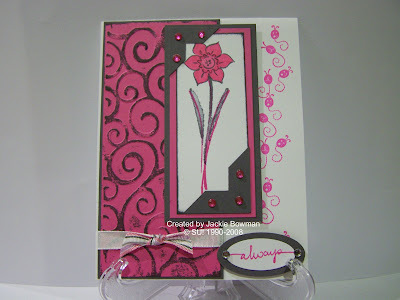 I just LOVE this card...love how you inked the embossed part...too cute! This is soooo pretty! Love it Jackie! I hope you are having a great day! very nice the embossing is beautiful! Gorgeous card! Have fun at the party! Beautiful card love the colours you used, nice bright cheery pink. Cute card. Love the border up the side. This is beautiful! Love the colors sketch! Lovely card, Jackie. You have inspired me to buy that photo corner punch. I love the way it looks. Can't wait for it to come. Such a pretty card! I love the color combo and image!